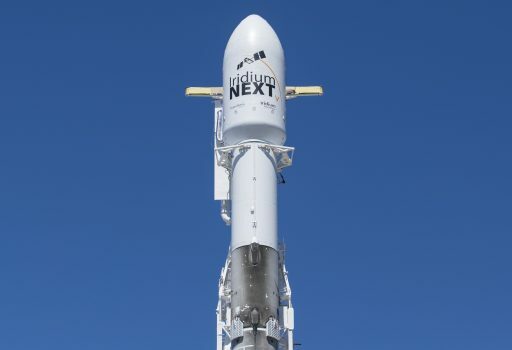 SpaceX's Falcon 9 rocket is set for liftoff from California's Vandenberg Air Force Base just after sunrise on March 30, 2018 to take the fifth set of Iridium-NEXT satellites into orbit. The launch, employing a flight-proven booster, will bring the Iridium-NEXT deployment to the 66% mark with 50 of 75 satellites in orbit. Soaring almost due south from California, Falcon 9 will expend its first stage and complete a two-burn mission of the second stage to lift the ten satellites into a 625-Kilometer orbit. Iridium-5 is the second mission for Iridium employing a flight-proven first stage, featuring Falcon 9 Booster 1041 that lifted the Iridium-3 satellites into orbit in October 2017.